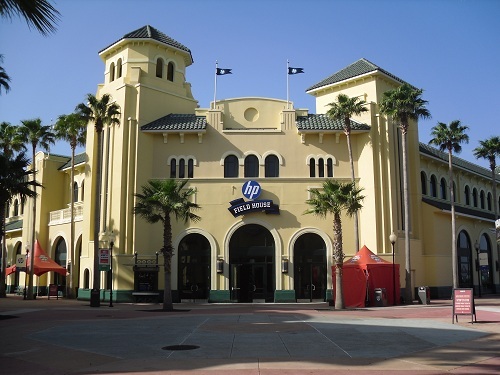 The milk must have soured because Disney just added a new sponsor for the former Milk House at ESPN Wide World of Sports complex. 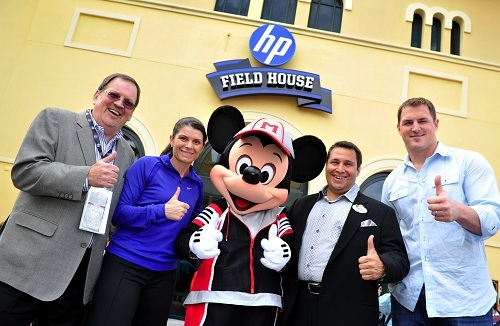 Walt Disney World and HP today unveiled the HP Field House at ESPN Wide World of Sports Complex during a ceremony that featured NFL star Jason Witten and soccer legend Mia Hamm, along with ESPN Radio’s Mike Golic and Mike Greenberg and executives from HP and Disney. 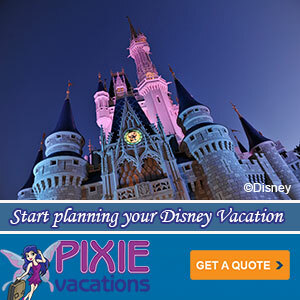 The project will deliver an immersive sports experience for the nearly two million athletes, coaches and spectators who visit Disney’s sports facilities each year. Joining in the ceremony: (L-R): Gary Elliott, vice president of Brand Marketing for HP, U.S. Women’s Soccer legend Mia Hamm, Mickey Mouse, Ken Potrock, senior vice president of Disney Sports Enterprises, and Jason Witten, NFL All-Pro tight end for the Dallas Cowboys. 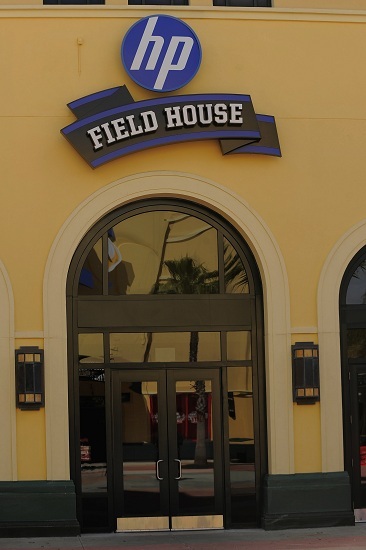 The 165,000-square-foot HP Field House, a multi-purpose facility that can accommodate virtually any indoor sport and has been the cornerstone of ESPN Wide World of Sports Complex since it opened in 1997, has been outfitted with a variety of innovative HP enhancements, such as touch-screen kiosks and a one-of-a-kind retail imaging area. Additionally, HP technology is being infused throughout the 230-acre complex, enabling athletes, coaches and fans to have an unparalleled “hands-on” sports experience while providing ways to customize their visit with amenities previously unseen in youth sports. The most prominent feature of the HP Field House is the HP Photo Creation Center, where players and fans can download, design and enhance commemorative photos and images from their events, then immediately produce and print them at an onsite retail location. Guests will also be able to purchase life-size posters of action photos from the complex, wallpaper coverings, multi-page calendars, photo CDs and many other unique photo keepsakes, giving athletes, coaches and fans even more ways to cherish their sports memories long after their competitions have concluded. “Today’s youth athletes are extremely tech savvy and HP is the perfect partner to help them better capture and savor the lasting memories of their unique sports experience in ways that no other sports venue can,” said Ken Potrock, senior vice president, Disney Sports Enterprises. I’m not sad to see the milk mustaches go from the pavilion. It sounds like HP will help youth athletes create some neat keepsakes from their trip to the sports complex. I’m just a little sad that it’s turned into yet another merchandise opportunity. I’m a little confused about where they get the name ‘field’ from since the facility houses basketball and similar sport courts. I guess court house had the wrong connotation. Previously: ESPN WWOS grand opening.